The Glendale Chocolate Affaire features not only a celebration of chocolate, but also romance. Held just before Valentine's Day, dozens of chocolate specialty vendors will be on hand offering unique chocolate-related creations. Will there be chocolate chipotle popcorn? chocolate crepes? chocolate caramel potato chips? chocolate lemonade? You'll have to check out all the offerings to find out. I'm sure there will be traditional chocolate delights as well, like fudge and chocolate dipped strawberries. 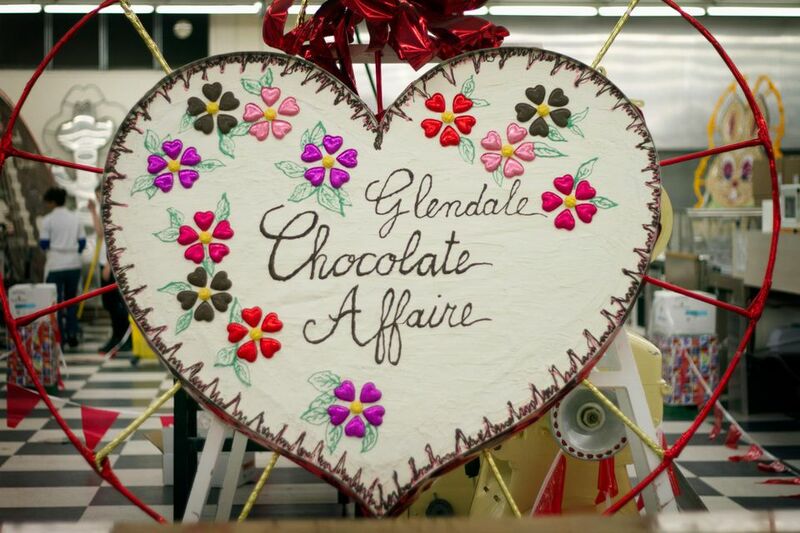 When is the Glendale Chocolate Affaire? Saturday, February 9, 2019 from 10 a.m. to 10 p.m.
Sunday, February 10, 2019 from noon to 5 p.m. It is at Murphy Park. Here is a map with directions to Historic Downtown Glendale. You don't need tickets for the Glendale Chocolate Affaire. Admission is free, parking is free. What else should I know about the Glendale Chocolate Affaire? Cerreta Candy Company will offer tours all weekend. It is about eight blocks from the site of the Glendale Chocolate Affaire. Sometimes there is a shuttle service, but if not, and it is a nice day, it is worth the walk! Cerreta's conducts factory tours all year long on weekdays. The tours on Glendale Chocolate Affaire weekend are usually special, and allow you to see more of the inner operations where they manufacture their chocolate creations. There are more tips below. On Saturday a Plein Air Competition usually takes place, where festival attendees can watch as artists paint while the event happens around them. Judges vote on the most decadent and delicious chocolate treats at the Sweet Tooth competition. The contest takes places on stage, Friday evening. Come to the Glendale Chocolate Affaire with a big appetite! Many of the food and beverage booths offer free tastes of their products. Not a chocoholic? I also saw items like olives, nuts, and dips. There are also traditional food vendors (no free samples) offering snacks and beverages. The booths are arranged in Murphy Park which has a brick walkway. Still, there were uneven parts, so those who aren't steady on their feet should be careful. There is live musical entertainment at the Glendale Chocolate Affaire. The shuttle to Cerreta's, a major sponsor of the event, is free. Don't miss this tour—it's fascinating. I'm betting you'll get free tastes at Cerreta's! There is plenty of free parking around Historic Downtown Glendale. Preferred garages charge a fee. The Romance Writers are just outside Murphy Park, as is the shuttle to Cerreta's. This is the largest gathering of romance novelists in the Southwest. Authors will make appearances, sign autographs and offer free writing workshops. Warning: it will take immense self-control not to eat those chocolate-covered strawberries that you purchased for your sweetheart for Valentine's Day. Be strong! For more information, visit the City of Glendale online. Got Ink? Get Some at Hell City!